In January of 2008, my family went to Niagara Falls for my brother’s hockey tournament. During one of his games, my mom got a phone call. I wasn’t listening; I was watching the game. The next day, we went home. My brother went home with his friends so we arrived home first. As soon as we came home, I went straight to my room. I was so happy to finally be home. My mom came in shortly after saying “Go say hi to Nana.” My nana lives with us but I figured she was asleep when we got home. I walked into her room and around the corner of her bed walked a little puppy. He was a beagle. 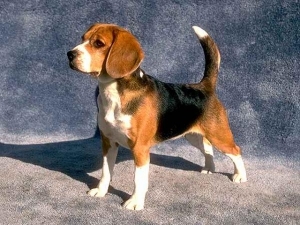 characteristic may be different for different beagles. If you are not home a lot don’t get a beagle. They need a lot of attention and need to be walked at least once a day, even if you have a yard. is incapable of being their friend. They are great guard dogs. They know a bad person when they see one. They also know emergencies. One night, a brother of mine fell asleep and forget to take his potato skins out of the oven. Chester came right in and woke up my mom. There could have been a fire but it was because of Chester that we didn’t have a fire. Unless we have brought a person into the house, he treats everyone like they are going to hurt us. He is smart, and realizes as soon as they are welcomed into our house, they’re okay. stayed with my brother in Grand Rapids for a few weeks. They did not tell him to “drop it,” and when he came home he did not know what to do when we told him to do so. It took him just a little while to be house broken and he only goes outside now. He knows the tricks sit, sit up, play dead, shake, roll over, dance(twirl), and high-5. It was easy to teach him, just make sure you give them a treat because that’s what will make them learn. To re-cap, beagles are excellent dogs. They are adorable and for families. Getting a beagle isn’t a good idea if you have a small yard, unable to get a fence, or are never home. They are hunters but they don’t know much unless you teach them to hunt. A friend of mine has adopted a beagle and stayed with her for years, and she has to fly him back to Indonesia when she has to go there too. Beagles are short but heavy They are lovely and is sweet to their master. We had a beagle for years she was a smart dog and great with kids, Are kids were all over her, But when she got lose and her nose got going she was gone so we had to watch her all the time. But I think beagles are great dogs to have and own, And great family dogs.